I thought it would be interesting to note that what ended up replacing the Piccadilly Fish & Chips was a tiny strip mall including a chain restaurant called the Original House of Pancakes (hence the “Say No To Pancakes” sign). Piccadilly has opened up a new location at 1450 South State Street, which I have yet to visit, but the building just can’t compare to the old tudor. And I don’t know if you have been in Salt Lake long enough to have lamented the passing of Bill and Nada’s Cafe, but that was a truly tragic demise. Bill and Nada’s operated for several decades right by Trolley Square, with the slogan “We Never Close,” and served the popular dish (to their patrons at least) of brains and eggs, right up until they did close in 1999. The cafe was a Salt Lake institution and loved by people from all walks of life. I don’t think the old diner changed in any significant way, right down to the waitress’ uniforms, from the time they opened. The building was torn down not long after the cafe was closed, and the lot where it stood still lies vacant. It’s a sad reminder of what we lost. I found a kind of nice tribute page to Bill and Nada’s at Bill and Nada’s Cafe. I never did a followup to Recycled Buildings. I live right next to the “strip mall” so I really should have. I was just talking about Recycled Buildings, so I didn’t really feel like I needed to followup that story, but I guess I should have. Yes, they did build a pancake house and a Maui Taco in the spot where Piccadilly used to be. We lost one restaurant and gained two. It’s actually a much better use of the space and in retrospect, I’m glad they tore down the old building and replaced it with a couple of good restaurants. The best part is that we didn’t lose Piccadilly. They opened up on State Street. Mike and I have gone there a couple of times, since they’ve opened, which is all my stomach can handle in the year or so they’ve been there now. I like greasy fish and chips, but they can only fit into my diet rarely. The same goes for pancakes, actually. The Original Pancake House is the new trendy breakfast place to go for breakfast and it’s packed every morning. You pretty much have to go there in the afternoon to get a table because it is so busy. Quite frankly, if I’m going to splurge on pancakes, I want to go to IHOP because they have four flavors of pancake syrup. I have no idea why The Original Pancake House is so popular right now. Probably because they’re new. Maui Taco, on the other hand, is a blessing. We eat there about three times a month. It’s the closest place to our house to get an enchilada. We have walked over there in the snow, rain and heat. We love that place and I can always make room in my diet for a fish taco. 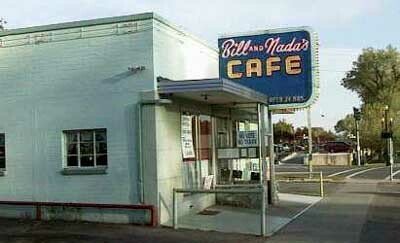 Bill and Nada’s Cafe, however, will have to wait until tomorrow. Wondering why the OPH is so popular? Quality ingredients! I can’t speak for the OPH in your state but in Minnesota the wait is worth it. I’ve been to other OPHs but the one in Edina is my favorite. Everything is delicious and the service is wonderful. They are friendly and though not as regular, as some, the staff knows me and my kids by name. It’s like going to a favorite aunts place for breakfast.